How about some drive-in marathons this weekend? In Lucasville OH, a heated ozoner tests patrons' courage with a free "Object of Terror" giveaway. Ibrahim Dieng lives off the grid. Born "around 1900," he was around before the grid. His country, Senegal, has been independent from France for less than a decade at the time of Ousmane Sembene's picture. In Africa, you could do worse than Senegal; the country's never had a coup and its first president was a man of letters, albeit one who threw his first prime minister in prison. Whether any of this matters to Ibrahim is unclear. The country is poor and so is he. He struggles to make ends meet from day to day, with two wives and their children to support and no job for four years. He lives off store credit, borrowing from friends and relatives, and favors from politicians and bureaucrats. An unusual windfall comes when a nephew working his way through night school as a Paris street sweeper sends a money order (in Wolof, "mandabi") for 25,000 francs to be divided between Ibrahim and his sister's family. Wonderful news! All Ibrahim has to do is cash the money order and he can pay off his tab at the neighborhood store and keep his family fed for a while. There's a temptation to call Mandabi Kafkaesque, but let's remember that "Kafkaesque" is just a label to describe a system of relationships that Sembene, adapting his own novel, perceives directly in social-realist terms. Mandabi is a bitter protest against corruption pervading every level of Senegalese society, but its hero isn't immune from his author's scorn. Sembene starts out making Ibrahim (Makhouredia Gueye) as disgusting as possible, slobbishly eating a gooey meal with his bare hands and belching painfully afterward. I assume he intends his audience to find his domineering attitude toward his wives contemptible as well, though the women aren't saints, either. After Ibrahim gets his nose bloodied in a scuffle with the photographers, they start wailing as if he'd been beaten to the brink of death and his precious money order stolen outright, in order to reap the charity of sympathetic saps in the neighborhood, and they're unrepentant when Ibrahim rebukes them afterward. Everyone looks for every opportunity to take advantage of everyone else. As a whole, Ibrahim is presented as a loser, and hardly a lovable one. At the same time, we can't help asking how hard it should be for the poor dope to get that money order cashed. That Ibrahim is mostly an unsympathetic character makes Mandabi a kind of black comedy, yet you can't escape the conclusion that he's been treated unfairly, that his predicament isn't necessarily his just desserts for being illiterate and shiftless, but definitely proof of all-encompassing injustice of which he's certainly not the only victim. Mandabi is appropriately raw looking, though I don't think the prominent boom mike shadow in one important scene was strictly necessary. Sembene's story doesn't need to be told in any flashy fashion; his biggest indulgences are the Paris scenes of the industrious nephew at work and one use of a wipe between scenes. The film's points of appeal are the universality of a poor man's plight in an increasingly complicated society and the novel immediacy (for the global audience) of its portrait of urban Senegal in the country's formative years. In the lead role, Gueye runs an emotional gamut impressively, from arrogance to abjection, begging for bus fare at one moment and blowing off panhandlers at another. He pulls off the film's necessary trick of getting you to pity its unappealing protagonist. 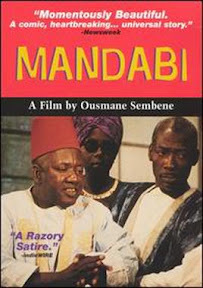 Like some of Warner Bros's pre-Code pictures, a damning or cynical portrait of poverty and corruption in Mandabi is marred slightly at the end by a mini-lecture delivered by one of the rare virtuous characters, a postman who tells a despairing Ibrahim that "we" should change their corrupt society, but Sembene redeems the moment and keeps the hero in character by having Ibrahim respond in self-pitying bafflement. Sembene's film -- his first in his native language -- may attract us as an authentic window into 1960s Africa, but his story has a timeless relevance that gives Mandabi more than merely historical value. Hell, hell! What we have here in Hajime Sato's lividly apocalyptic fantasy is an invasion from another planet. 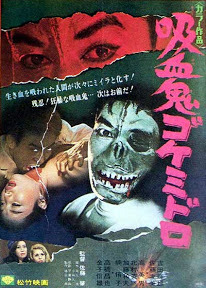 This is more of a sci-fi movie than the horror show the English language title suggests, though the original Japanese title translates to the equally horrific Gokemidoro Vampire. Now that I think of it, the translator probably opted for "Body Snatcher" because that suggested science fiction more than "Vampire" does. The "Hell" part I still don't get, though I suppose it could be argued that the characters of the film suffer in a hell at least partially of their own making. Goke opens disaster-movie style, introducing us to the crew and passengers of a doomed jetliner. They are a range of types, including a politician, an industrialist, a psychiatrist, a "space biologist," a young punk and an American woman -- a new widow traveling to claim the body of her husband, a Vietnam casualty. The news reports the assassination of the British ambassador to Japan, inspiring the comment that Japan is becoming more like America. It must be dangerous to be a politician, but Mano (Eizo Kitamura) shrugs off the danger, saying that you could never get anything done if you're always afraid to die. Little does he know the danger he faces. In short order, the pilot receives word of a bomb threat, and an investigation reveals a rifle in one passenger's luggage. The rifle's owner seizes control of the plane just as a UFO buzzes past and disrupts the power. The pilot manages a crash-landing that kills him and most of the passengers, leaving his co-pilot Sugisaka (Teruo Yoshida) and flight attendant Kuzumi (Tomomi Sato) our protagonists, and often the victims of the surviving passengers, for the rest of the picture. If the unreal red skies didn't tip people off to something being seriously wrong, the sight of the hijacker rising from the dead probably does it. He grabs Kuzumi and heads into the interior, where they discover a flying saucer. The hijacker is drawn inside while Kuzumi watches. Inside -- in an abstract set bearing no resemblance to anyone's idea of a spacecraft interior -- the bad guy is subjected to some sort of torture that opens a gaping wound on his forehead, through which an alien blob enters his body. For all intents and purposes, this blob is Goke, Body Snatcher From Hell, and it transforms the hapless hijacker into, I suppose, a Gokemidoro Vampire. Gokemidoro vampires are more like Transylvanian vampires than any Japanese concept. They bite people in the neck, despite lacking fangs, and drain their blood, albeit in a very clean, no-spill fashion. This, we will learn, is part of a Gokemidoro offensive against the planet, the goal being the complete extermination of human life. Bullets and bombs won't hurt these vampires, but fire will. I want to say, "I hope they've got more than that," but I would probably sound treasonous to my species if I did so. Bullets are useless against a Gokemidoru Vampire, but falling rocks just might work. Goke rivals Beneath the Planet of the Apes in its pop-art pessimism, reminding us that end-of-the-world fears remained pervasive material for cinematic exploitation well after the brink moment of the 1962 Cuban Missile Crisis. It was always just a few minues to midnight during the Cold War, and if Goke suggests that aliens will do us in, rather than us doing in ourselves, it still manages to say that we'll only have ourselves to blame for failing to come together. It's even bleaker for suggesting that individual foibles could be just as fatal for humanity as nationalist rivalries. It also earns automatic subversion points by making a politician its most despicable character. But for all its messages Goke is still exploitation cinema pandering to a uneasy urge to see the end of the world. It's arty in a trashy way, passionately committed to the color red. Cinematographer Shizuo Hirase reddens the artificial skies as well as news footage illustrating the world's violence. He uses red as punctuation when, after Mrs. Neal shoots Sugisaka, his blood drips onto a photo of the late Mr. Neal. It's also a riot of special effects, from the surprisingly plausible saucer shots to the rather unconvincing model heads through whose wounds the Gokemidoro ooze in and out. There's something perversely giddy rather than cautionary about Goke's doomsday scenario, as if director Sato and his writers had just said: drop the bomb, exterminate them all! Maybe that's the attitude you have to take if you want to convince people that they deserve it. Apparently, Goke was an exceptional product from the prestigious Shochiku studio, once home to such arthouse titans as Kenji Mizoguchi and Yasujiro Ozu. Science fiction and horror were so unusual for the studio that Goke and three other genre films have been collected in a new Criterion Eclipse box set, on the premise that a company unaccustomed to the material could only come up with something interesting. Goke, for one, suggests that Criterion is right. In old-time Hollywood, the rule was: if you weren't American, or weren't white, you could play any nationality. The rule even applied, albeit rarely, to blacks: Noble Johnson played a Russian in "whiteface" makeup in The Most Dangerous Game, and John Ford cast both Johnson and Woody Strode as Indians, and Strode as a Mongol. Throughout movie history, there have been designated ethnics, actors presumed capable of playing characters of any background. The actors themselves ranged from the Irish-Mexican Anthony Quinn to the Jewish Eli Wallach and the Egyptian Omar Sharif. With the coming of sound Ramon Novarro, who had a number of WASP roles on his silent resume, became one of the first designated ethnics. He made his first sound hit playing a South Sea islander in The Pagan. From there he could jump, with director Jacques Feyder in tow, from the Austrian soldier of Daybreak to a Hindu in Son of India. With Novarro's racial transformations the stakes of romance changed. Interracial romance was one great taboo against which Pre-Code cinema was loathe to transgress. Films from The Sheik to Whoopee! would tease the transgression, only to cop out with a sudden revelation that a hero of forbidden ethnicity was in fact white. But if Pre-Code can't countenance interracial romance -- or, to be more specific, interracial marriages -- it sometimes acknowledges that something's wrong with the picture its compelled to show. Son of India is such a film: a tragedy that could be condemned for its cowardice by 21st century standards yet ought to be acknowledged as a protest, albeit still cowardly, against the circumstances of the tragedy. Novarro plays Karim, the son of a wealthy Hindu jewel merchant and an expert appraiser by training. Father and son are travelling with some of their treasures concealed in various trick compartments, but that doesn't deter a bandit band from attacking their caravan. The father dies, but Karim survives with the help of an ascetic he'd befriended, who briefly buries our hero alive, with a big diamond for company, while the bandits ransack the camp. In rags, Karim makes his way to Bombay (the modern Mumbai), where he enters a fancy jewelry shop to sell the diamond. The merchant tries to tell him it's worthless, offering just 20 rupees, while Karim claims it's worth more like 20,000,000. When Karim leaves in disgust ("I thought you were a connoisseur! "), the merchant follows him out and publicly accuses the ragged young man of robbing him. The case gets taken to court, where an American tourist (Conrad Nagel) who had been in the store when Karim came in confirms our hero's story. In effusive gratitude, Karim offers to give William Darsey the diamond as a gift, but Darsey politely refuses the excessive offer, accepting instead a promise that Karim will do anything in his power to help him in the future. Others are now quite willing to buy the diamond at a fair price, and Karim is soon a wealthy man, a polo star and a social lion. Among the fans at the polo championship is Janice (Madge Evans), who's smitten by the dashing turbaned young horseman. Romance ensues despite the prejudiced objections of Janice's aunt; Karim appeals to the adventurous American girl, who goes with him on a tiger hunt. Karim discovers that his guides are the bandits who killed his father and takes revenge on the leader, but in the confusion Janice scratches herself on a poison plant. She's terrified at the necessity of Karim having to slice her arm with a dagger to release the poison, but she braces up when he slices his own arm to show how little it hurts. In a way, this moment is a symbolic wedding -- as far as I could tell, Karim didn't wipe his blood off the knife before applying it to Janice -- but Janice wants something more than symbolic. Re-enter William Darsey, who reveals to Karim that he's Janice's brother, and that he has a big favor to ask. However Janice feels, William insists that the couple can't wed, that Janice would never be able to return to America, that she and Karim would be ostracized even in India, and that for her sake Karim must renounce her. This is unthinkable and unacceptable to Karim until William reminds him of the obligation Karim placed himself under all those years ago. Now it's a matter of honor for both men, and a sadly triumphant William goes to Janice to tell her that Karim has come to his senses. Rightly, Janice won't believe this until she hears it straight from Karim. When they meet for the last time, it's clear that their ardor for each other is undiminished, but Karim has been steeled for duty by a visit from the holy man who'd saved him in the past, who calls him now to renounce worldly life altogether. In this way, Karim tells a heartbroken Janice, his love for her will remain pure and safe from society's scorn, as he hopes hers for him will remain despite everything. Maybe it will. Not until later in his life, as a character actor, did Novarro frequently play roles of his own Mexican nationality; as a leading man he more often played Spaniards. I'm not entirely sure of the rules for Mexicans in the bad old days, so I can't say whether it would be considered a forbidden romance for a white woman to love Ramon Novarro himself. You wonder whether seeing a handsome star like Novarro in a variety of ethnic roles raised questions about ethnic barriers for his fans. Did he become less desirable the less white he became? It's hard to imagine, and the message of Son of India is, in fact, that Novarro is no less attractive as a "brown" man. But Feyder's film -- his last in the U.S. -- betrays its (and Novarro's) roots in an older era in its finish, not because the star-crossed couple surrenders to prejudice, but because the surrender is an exercise in the pathos of renunciation that was common in American silent film, whether practiced by a clown like Chaplin, a grotesque like Chaney or any number of fallen women. While Son of India's surrender to racism makes it an obsolete film for 21st century viewers, the pathos of renunciation more likely made it obsolete (depending on its actual box-office performance) for Depression audiences who increasingly wanted to see people get away with stuff. However obsolete it may be by any standard, it's another charmer of a dress-up star turn by Novarro and an amiable bit of exotica overall until its obnoxious ending. Obnoxious it may be, but it was made to make people cry eighty years ago, and it might well do that today. Feyder, an acclaimed French director playing out his M-G-M contract before returning home, does nothing special here. There are hints from publicity that Novarro had considerable creative control over this project. Whether that's true, there's definitely a sense, absent from Mata Hari, that Novarro is in his element. While Ben-Hur is by far his best known silent success, a more characteristic triumph was Ernst Lubitsch's Student Prince in Old Heidelberg. Though not a European, Novarro somehow seems a natural as a military man in times and places where armies seemed more like college fraternities and duty required little more than looking good in uniform. As Smith reminds him in Daybreak, Novarro has no training for any other work and would probably be hopeless in business. In uniform, he's a strutting charmer, and one suspects that the actor's own enjoyment of uniforms shines through in his costume pictures -- though he was also popular nearly naked as various kinds of "pagan." In this talkie, at least, you can understand some of Novarro's peak popularity. He's masterful in a scene when he climbs a table to hustle money from his brother officers to cover the hospital expenses of one's clandestinely pregnant girl. With Garbo he couldn't be the aggressor, but in one of his own star vehicles he has a cocky vitality that plays well against the initially meek Chandler. There's something adorable about her embittered attempt to play a kind of vamp (was she typed?) after her humiliation; you know she doesn't really have it in her. She and Novarro have good chemistry, particularly in Feyder's best-shot scene: a sequence of tracking shots as Novarro first rides a coach down a street, pursuing a huffily walking Chandler, then trades places to walk as she rides, only to run stumblingly to keep up as Chandler orders the coachman to drive faster until she finally relents and lets him ride with her. This is the sort of material that was assumed obsolete with the Depression, but Daybreak proves that it still had life in it. There's even a whiff of genuine Pre-Code -- though it may come straight from Schnitzler for all I know -- in a barracks bath scene where Novarro, soaking in a tub, notices that his orderly, who's been helping scrub him, is wearing a pair of Novarro's underwear over his own trousers. They'd shrunk in the washing, the lackey explains, and he was only trying to stretch them back out. Do you like them? Novarro asks. "They're wonderful," the minion confesses before Novarro throws a wet towel at him. Given Novarro's own reported homosexuality, modern viewers may involuntarily activate their "gaydar" when watching his movies, but a scene like this throws any gaydar on another character, and regardless of what you know or otherwise suspect about the actor an openminded viewer should find his romance with Chandler easy to accept. The man could act. Daybreak is feather-lite fare despite its tease of suicide, but it could well knock over a skeptic's resistance to Ramon Novarro's starry charm. ...but has competition this Thanksgiving. This counts as family fare as well, I guess. Meanwhile, moviegoers in New York City get a special treat, though it means not much of a holiday for Shirley MacLaine. After the holiday comes "Black Friday." I don't know if the term was used in 1962, but here's a show in Charleston that lives up to it. With Irvin Berwick's Crown International release from 1961, Something Weird's new Weird-Noir collection really starts living up to its label. The Seventh Commandment is the sort of film that has to have a low budget; it would lose its impoverished, grimy authenticity otherwise. It looks and feels like the movie the characters in the picture might make, filmed in a flophouse, given the opportunity. There's no glamour here, and that makes the femme fatale's pretensions to glamour all the more pathetic and vile. Berwick's picture takes place in a pathetic, vile universe unredeemed by the faith that also pervades it. Here, faith is an accomplice to murder. The story starts with a plot device out of Gabriel Over the White House: a mediocre man acquires strange, divine powers after surviving a car wreck. Ted Mathews (Jonathan Kidd) is celebrating his graduation from a night-school course in business administration by joyriding with his impatient girlfriend Terry (Lyn Statten) when they collide with another car and go over an embankment. Barely hurt, Ted checks on the other car after verifying that Terry's still alive. He sees an unconscious, bleeding driver and, convinced that he's killed the man, seems to suffer traumatic amnesia, heralded by watery dissolves. He barely acknowledges the still-unconscious Terry before wandering from the accident scene. Ted's wandering takes him to the trailer of an itinerant preacher with a Noah's Ark on wheels. This modern Noah takes Ted and sets him up as a faith healer. Now called Tad Morgan, he has talent for his work. We see him give hearing to the deaf and life to the limbs of a lame boy as a devout crowd watches slackjawed, arms prayerfully and creepily crossed over their chests. Tad's power keeps the cash flowing in, which he hopes to convert into a children's hospitals. Soon, however, Terry reappears. She's been on a downward spiral since taking the rap for the car wreck. She keeps house with Pete (John Harmon), a wretch who rolls rummies to keep the couple in booze. She approaches Tad for some money, but when she realizes that Tad, barely remembering the accident, still believes that he killed the other driver, who only suffered a concussion, she also realizes that Tad is ripe for long-term blackmail. When she gets impatient with occasional checks -- the booze seems to run out faster and faster -- she decides to marry Tad, to Pete's jealous dismay. But first she has to get Tad seriously, profoundly liquored up. This lubricated courtship climaxes in a travesty of a marriage, Terry propping up a barely conscious Tad while a skeevy JP performs the ceremony, then dumping him to the floor the moment the man pronounces them husband and wife. Through it all, her strange if not inexplicable attraction to Pete persists. Codependence is a hell of a drug. Having touched bottom, Tad struggles to free himself. Drastic action is necessary. The moment comes on a dark stretch of bridge as a weary Terry sits on the stone ledge and demands a foot rub. Tad complies but starts pressing too hard, until he heaves her over the side and into the drink. He runs repentant back to church, but as if she, too, had been transfigured by that original accident, Terry seems unkillable. Like a raunch Rasputin, or like a wet rat, she rises from the waters and returns home, where Pete has made himself at home, put on Tad's robe, and passed out drunk in the marriage bed. Seeing only the robe, and probably seeing red, Terri gets a gun out of a drawer and fires four shots into her true love. Realizing her mistake, Terry stalks Tad at the church and through a cemetery as the film nears its dark epiphany. Confronting him at last, Terry fires her last two shots, but praise God! Tad's Bible absorbs the bullets. As if possessed, Tad begins reciting the Lord's Prayer as he puts his hands over Terry's throat and chokes the evil life out of her once and for all. He had been given the power to heal, but maybe his mission on Earth was to kill, after all. For now that his work is done, the heart attack hinted at earlier strikes him on the church steps, and his soul departs his body for parts unknown. The synopsis speaks for itself: The Seventh Commandment suffers from a spiritual confusion that could only come from deep if not uncritical faith. It's all too straightfaced and guileless, if not artless, to be written off as cynical exploitation. It's like a tale told by a raving, repentant drunk, while he's still drunk. Naively depraved, its exploitative moralism is laughably appalling. You may be content to laugh, but you should be appalled. You may be appalled, but you ought to be laughing, too. This film is a genuine nightmare, but for someone to have this nightmare is sort of laughable. What I'm saying is that if you have a taste for something other than good taste, if you're morbidly fascinated by the sometimes feverish sincerity of bad cinema or just like to laugh at it, The Seventh Commandment comes highly recommended. Labels: 1960s, film noir, religion, U.S.
A Top 100 countdown of the greatest comedy movies, based on lists contributed by a diverse sample of fans, continues at the Wonders in the Dark collaborative blog. Blog-wrangler and generous soul Sam Giuliano invited me to contribute another essay to the countdown -- the previous one covered Laurel & Hardy's Big Business -- to mark the Buster Keaton film Our Hospitality's place at No. 24 on the list. I watched the film for the first time in several years earlier this month and saw thematic elements I hadn't noticed before, particularly how Buster's train journey serves as a coming of age in a symbolically young America, right down to the train severing a symbolic (and dangerous) umbilical cord. Lest that make the film (or my essay) sound pretentious, rest assured that Hospitality is still one of the funniest features of the silent era. To read more, and to see the complete countdown to date, follow this link and find your favorites! If you don't find them, they could be yet to come. Labels: 1920s, Buster Keaton, comedy, silents, U.S.
Like his American forebear, the spaghetti western cowboy is typically a laconic figure, if somewhat more sardonic than the original. He is a man of few words and many bullets. But every rule has its exception, and Thomas Hunter is an exceptional spaghetti western star. Carlo Lizzani's western was Hunter's second essay in the genre. He plays a wronged outlaw, one who sacrifices himself to the army, having stolen from them, in the expectation that his partner, who gets away with the loot, will take care of his family while he does time. He does some pretty hard time, as an opening credits sequence illustrates, and when he's released he finds his family home a ruin and his family gone. His wife's journal reveals her declining fortune and a betrayal by the hero's partner, who has not shared his plunder. The truth hurts, and Hunter wants you to feel it with him. Before long, men are out to kill our hero, Jerry Brewster. Right at that time, Jerry discovers a squatter on his desolate property. The squatter, Winny Getz (Dan Duryea), is armed, but finding Jerry the underdog under siege takes his side. Jerry learns that his old partner has taken another name and used his ill-gotten gains to become a big rancher. Winny gets a job as a ranch hand to spy on the wealthy Mr. Seagull (Nando Gazzolo) while Jerry heads into the nearest town and picks a fight with some of Seagull's bullying ranch hands in a saloon. He impresses the saloon keeper, who complains of Seagull's oppression of the town and agrees to back Jerry's scheme to ruin the rancher. But before things can go further Jerry is waylaid by more of Seagull's goons, led by foreman Mendez (Henry Silva). Not knowing Jerry's real agenda, Mendez is impressed enough by the man's toughness against heavy odds to give him a job on Seagull's ranch. Along the way, Jerry befriends a boy being raised by Seagull's sister; the kid's mannerisms strongly remind our hero of his own long-lost son. He also makes an enemy of the local saloon singer, who resents the way his lucky gambling streak distracted from her performance his first night in town. She pines for Mendez while Mendez himself has eyes on Seagull's sister. It sometimes seems like every Henry Silva movie has a shot like this. Jerry's now ideally placed to stage a large-scale robbery of Seagull's horses and to send the town intelligence on Seagull's plans. When Seagull orders a reprisal against the town, and Mendez expects him to ride with the other hands, Jerry entrusts a warning message to the kid, only to find that it never reached the saloon keeper. No longer able to rely on the town's support, Jerry finds the odds growing against him when the singer, having nabbed the kid, rats him out to Mendez. Our hero will need Winny's help if he hopes to get his revenge on Seagull. Dan Duryea (below) is our hero by default just for getting Thomas Hunter (above) to shut up. Thomas Hunter didn't do many spaghetti westerns, though he did return home to do a Gunsmoke episode and play Ike Clanton in a TV movie before making his most substantial contribution to cinema as author of The Final Countdown. His approach is all wrong, though director Lizzani, making his first western, probably should share the blame. Lizzani at least learned his lesson and followed up with Requiescant (aka Kill and Pray), a more highly regarded effort. Showing your emotions shouldn't be forbidden in spaghettis or any western, but Hunter's emoting goes way over the top. It would be over the top in any genre, and it's not a good idea for a western hero to sound like a whiner. Worse, Hunter's histrionics encourage the worst hammy impulses in Silva, with little apparent effort from Lizzani to check either actor. By default, Dan Duryea, a great villain in Hollywood westerns, comes off best, despite his age and apparent illness, as a comparatively laconic, enigmatic figure. Duryea doesn't really have much to work with but it's still cool to see him play a hero -- and ride off into the sunset -- in one of his last roles. Lizzani -- still working at age 90, with a film out last year -- doesn't have the same pictorial genius as Sergio Leone or Sergio Corbucci, but he stages two impressive large-scale action scenes: the horse-rustling scene, complete with flaming logs reminiscent of Spartacus, and a gunfight in the deserted town pitting Hunter and Duryea against Silva's goon squad. Hunter's more personal showdowns with Silva and Gazzolo are anticlimactic by comparison. Ennio Morricone contributes a score that's characteristic but not much more than that. He's credited as "Leo Nichols," and you could believe that "Nichols" was just a Morricone imitator. The music still sounds good, but it's really just another day at the office for the maestro. At least he got a respectable pseudonym. Lizzani was stuck with "Lee W. Beaver." Hills Run Red isn't a top-flight spaghetti western; whether that's the fault of the star subverting the story or the story subverting the star is hard to say. But it has its moments and you definitely can do worse. Steven Spielberg and Tony Kushner's history play was many years in the making, in part because the once-mightiest Spielberg had a hard time getting backing for a history film. The delays cost him a star -- Liam Neeson -- who is ironically more bankable now than he was when Spielberg first proposed him for the title role. Given Lincoln's long road to the big screen, it's another irony that people this November are debating its relevance to current politics -- and a further irony that it is relevant. As it happens, Spielberg and Kushner have made a cinematic intervention, intentional or not, in a debate, not between the Democratic and Republican parties, but within the Democratic party and the larger liberal movement. This debate has gone on since the 2008 presidential primaries and will certainly continue into Barack Obama's newly-won second term. It's less a debate over personalities, though it originated in comparisons between Obama and then-Senator, now-Secretary Clinton, than over practical politics. Critics of Obama -- one of the most persistent and verbose is the historian Sean Wilentz -- worry that the President is too much a creature of rhetoric and the favorite of people too enamored with the supposed power of rhetoric. These critics feel that many liberals naively expect to rely too much on the power of ideas and argument, and are reduced to bitter helplessness when their eminently reasonable arguments fail to persuade intractable dissidents. Wilentz himself wrote a long, somewhat controversial piece that could serve, perhaps as much as Doris Kearns Goodwin's best-selling Team of Rivals, as a source text for Lincoln, criticizing a perceived perception among liberals that Abraham Lincoln relied entirely on his admittedly formidable powers of persuasive rhetoric -- that he saved the Union by delivering the Gettysburg Address and the Second Inaugural, and found answers to all problems in his speeches, if not in the funny stories he loved to tell. Wilentz invokes a more Machiavellian Lincoln, one who wasn't above various forms of sub-rhetorical persuasion and manipulation when those were necessary to realize his goals. For Wilentz's Lincoln, a noble goal justifies a broader, more effective range of means than many liberals permit themselves or think appropriate in politics. Wilentz's article was virtually a preview of Spielberg's film. Kushner's screenplay focuses on the month of January 1865, after Lincoln's re-election but before his re-inauguaration, which under the old rules would take place in March. The Union is on the brink of attacking the Confederacy's last functioning port city, while the Confederate government has dropped hints of readiness to sue for peace. The President (Daniel Day-Lewis) is determined to get the 13th Amendment to the Constitution, already approved by the Senate, approved by the House of Representatives on its second try. Lincoln's Republican party controls the House, but he needs a two-thirds majority for a constitutional amendment and thus needs support from a largely-racist Democratic party for an amendment banning slavery. Lincoln faces a dilemma. There's a possibility that the war could end that month if he meets with the Confederate negotiators. But he worries that, should the war end before the amendment is ratified, ratification will never happen because he has justified action against slavery, including his earlier Emancipation Proclamation, as wartime measures. He worries especially that should the law revert to the status quo ante bellum, blacks already freed under the Proclamation could be returned to slavery. On the other hand, perpetuating the war for any period of time carries a personal risk. His eldest son Robert (Joseph [are you sure that isn't Robin Todd Lincoln?] Gordon-Levitt) is ashamed of missing the war in college and wants to enlist, while the prospect of losing another son -- a younger child died of illness in Abe's first term -- could well break Mrs. Lincoln's (Sally Field) mind, if not the Lincolns' marriage. The President's plan is to stall the peace negotiations and deny the existence of Confederate negotiators as long as possible while cajoling the necessary Democrats into supporting the amendment and dissuading Robert from enlisting. Spielberg sometimes strains within the self-imposed straitjacket of Kushner's screenplay. He wants to show more than the script requires and gets away with a brief opening battle scene that proves a flashback narrated by a black soldier in the true opening scene. Interestingly, Spielberg invokes The Godfather by pulling back from a close-up of the soldier to reveal the back of the star's head while the soldier goes on with a functional equivalent of an "I believe in America" speech, which Lincoln finally answers with small talk and a joke about his untrimmable hair. Lincoln's notorious jokes become a kind of Tarantinian device, serving as showoff business for Day-Lewis and within the story as a distancing and delaying tactic, stuff to fill the air as Lincoln contemplates his true answer or his next move. At these moments Day-Lewis approaches the enigmatic Lincoln of Gore Vidal's novel, perhaps the definitive fictional representation of Old Abe. But the main work of the film is to show a Lincoln made neither of marble or pure spirit, an intimately vulnerable man who can slap his son in public and threaten his wife with the madhouse in moments of anger -- someone who couldn't find an answer for everything with words. In a year of strong male star turns Day-Lewis, already a two-time Oscar winner, deserves consideration for a third along with such likely front-runners as Joaquin Phoenix (for The Master) and Denzel Washington (for Flight). People have commented about the age difference between Day-Lewis and his Mary, Sally Field, not to mention the age difference between Field and Mary Lincoln circa 1865, but as a two-time winner herself Field is a worthy consort and definitely delivers on whatever promise Spielberg saw in her. They're supported by a sprawling ensemble operating in different modes, from Jones's grandilouqent bluster to Spader's clowning, yet combining for a mostly convincing evocation of 19th century speech. The few anachronistic exceptions ("Slavery, sir? It's done.") can be forgiven. Kushner and Spielberg succeed indisputably in making the points they want to make about Lincoln and the art of political persuasion. If there's a problem with Lincoln, it's that, after the point is made, the film goes on -- and as it goes on Spielberg slips his restraints and goes hunting after epiphanies. Worse, the director decides he can't leave without addressing the assassination, but goes at it indirectly, focusing on a child's grief in a theater other than Ford's before flashing back to the Second Inaugural, Lincoln reappearing in a flame for some parting comments as if this were The Greatest Story Ever Told. A more persistent problem for Spielberg is his inability to imagine a movie without hearing the music of John Williams. The old maestro contributes an understated yet predictably Ken-Burnsian score, intruding politely yet predictably at all the predictable moments, that proves again that Williams hasn't had much new to say musically for some time now. 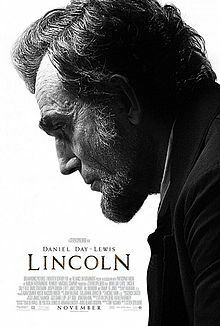 The music, however, is a superficial flaw, and the film's other faults keep their distance from an impressive core, leaving Lincoln as one of the superior American history films of recent times. It isn't as powerful as Spielberg and Kushner's previous collaboration because Lincoln doesn't give Spielberg as many opportunities for creative, forceful pictorial storytelling as Munich did, but after seeing Lincoln the word from Kushner that he's started work on a third screenplay for Spielberg comes as welcome news. Labels: 2012, Civil War, history, Spielberg, U.S. According to author Patrick Macias, Tetsuro Tamba basically conned his way into his first English-language movie by exaggerating his knowledge of the language. The Japanese star reportedly served as an interpreter during the Allied occupation of his country, but Macias says that his real service was as a tout pointing the hottest niteclubs, etc. If Macias's account in Tokyoscope: The Japanese Cult Film Companion can be credited, Tamba, knowing his limitations once cast by director Lewis Gilbert, seduced an English woman into becoming an informal tutor. However it happened, Gilbert was impressed enough to cast Tamba in his most famous English language role as the "modern ninja" Tiger Tanaka in the James Bond film You Only Live Twice. Watching The 7th Dawn, you can see why Gilbert was impressed. Tamba's English is stiff but he invests it with personality and he makes a charismatic villain in Gilbert's tragedy, adapted by Karl Tunberg from an Australian novel, of the last throes of English imperialism. Tamba opens the film fighting his own people. He plays Ng, a Malayan resistance fighter against the Japanese occupation of his British-ruled country. Fighting alongside Ng are a schoolteacher, Dhana (Capucine), and an American adventurer, Ferris (William Holden). The film begins with the end of World War II, as our trio of heroes celebrate and separate. Ferris intends to buy up rubber plantations and wants Ng as his partner, but Ng is going to college in Russia. The alarm bells obviously started ringing right there for 1964 audiences, but despite Ng's transformation into a ruthless revolutionary, the film never becomes anti-communist propaganda. I can't even recall the word "communist" being used, though everyone will assume that Ng has become one. We jump forward to 1953, by which time Ferris has largely realized his dreams of land and wealth, Ng has become a guerrilla leader fighting the British, and Dhana heads a teachers' union while leading nonviolent protests against repressive British measures like a ban on bicycles. Our trio remains bonded in subtle ways. Dhana is Ferris's mistress but pines for Ng, while Ng has exempted Ferris's property from guerrilla attacks and is happy to see Ferris when the American finds his way to Ng's base in a vain attempt to discourage violence. Ferris takes Americans' preferred position in the middle, questioning the sincerity of Britain's desire for a peaceful withdrawal while deploring Ng's increasingly terrorist tactics. There's plenty to deplore on the British side. In reprisal for a grenade attack on a party for the new Resident, the army burns down a village. Failing to prevent this atrocity -- admittedly, the Brits evacuate the residents first -- Dhana briefly takes refuge in Ng's arms, and thus seals her own fate. Dhana is soon arrested for carrying grenades in her bicycle pack, despite her protestations of innocence. Knowing her relationship with Ng, the Brits pressure her to reveal his whereabouts -- Ferris won't tell them -- to save herself from the death penalty. For a while it's possible to believe that the British framed her, but whatever the truth is -- we'll find out eventually -- Ferris decides chivalrously that he'll personally capture Ng in order to save Dhana. Complicating the story is Candace, the Resident's daughter (Susannah York), who's crushing on Ferris but feels sorry for Dhana, the mistress she's supplanting. After the arrest, Candace seeks out Ng, proposing to make herself a hostage to force her father to order Dhana's release. Ng is willing to play along, of course, but makes the conditions clear: if Dhana dies, so will Candace. It seems that anyone can find Ng if they really want to, and before long his camp is hit with an air strike and invaded by paratroopers. Ng barely manages to escape, keeping Candace as a personal hostage, only to run into a gun-toting Ferris. A race against time begins as the trio must hack their way through the jungle and deliver Ng to the authorities before Dhana is executed. I won't spoil any more, but remember that I did call the movie a tragedy earlier. The 7th Dawn could be a generic William Holden movie, merging Holden the self-interested cynic with Holden the Asiaphile. The pulpy political context makes Holden almost Bogart-like here, Ferris being torn between an instinct for prosperous neutrality and the need to take a side, if only for one person's sake. The best thing about the movie, in story terms, is how the main characters never reduce to types, but remain more defined by their relationships with each other than by anything else. Ng is probably the most enigmatic character of the group. No matter how ruthless he's shown to be, he still seems to want Ferris's friendship almost to the end and to play fair with him, to an extent. You could get the impression that he cares more for Ferris than for Dhana, but I don't think the movie actually means to go there. What makes Ng a tragic villain is that he wants to be friends (or more) with his old comrades-in-arms even as he stands ready to use or sacrifice them for his revolutionary ends. His sin isn't Communism as such -- he has no plans we hear of for after the British leave -- but the ruthlessness that Cold War propaganda identified as an essential Communist trait. His fate doesn't discredit the anti-colonial cause, which has Dhana as a more positive model, but the film ends with a pessimistic prophecy, perhaps more relevant to other countries than modern Malaysia, that things will get worse rather than better. Fortunately, an American like Ferris can just walk away this time. Gilbert proves himself an able wrangler of masses of people and munitions in exotic settings, 7th Dawn no doubt serving as a kind of audition for his Bond gig. It has that authentic feel that few modern adventure films can manage in our CGI-ridden era, and Freddie Young's cinematography highlights the diversity of locations, from the imperial swank of the Resident's party to the green prison of the jungle. Riz Ortolani contributes a characteristically lush score, its romanticism a constant counterpoint to all the violence and tragedy. The 7th Dawn is no classic, but its narrative clarity and conviction are enviable compared to many more pretentious or supposedly more psychologically sophisticated movies made today.